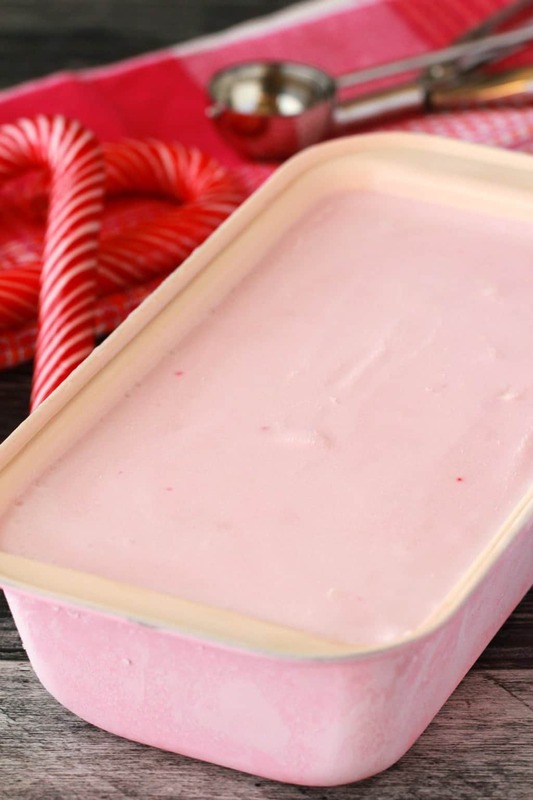 So when I first saw peppermint ice cream online I was a bit confused. Cos you have the mint ice cream, which is green (usually), and peppermint ice cream, which is pink! 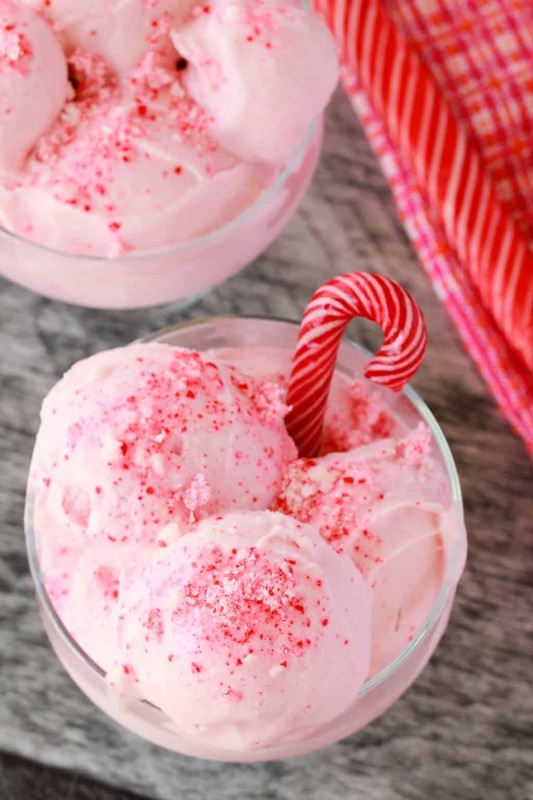 But then I realized that you add in crushed peppermint candy canes and suddenly the pink color made perfect sense! And the more minty/pepperminty things there are in the world, the better as far as I’m concerned. I added in quite a bit of crushed candy cane for this ice cream, because why not! But then while I was churning the ice cream I had a bit of a panic at first because I didn’t know if I was supposed to put the crushed candy canes in at the beginning or the end, and I had gone with the beginning, but was hearing some strange noises coming from my machine and was hoping like heck the candy pieces weren’t scratching my ice cream bowl! Luckily, they weren’t and all was fine. So I think throwing them in at the beginning is okay, but later on (when the ice cream has churned for a while and is thicker) would be good too. 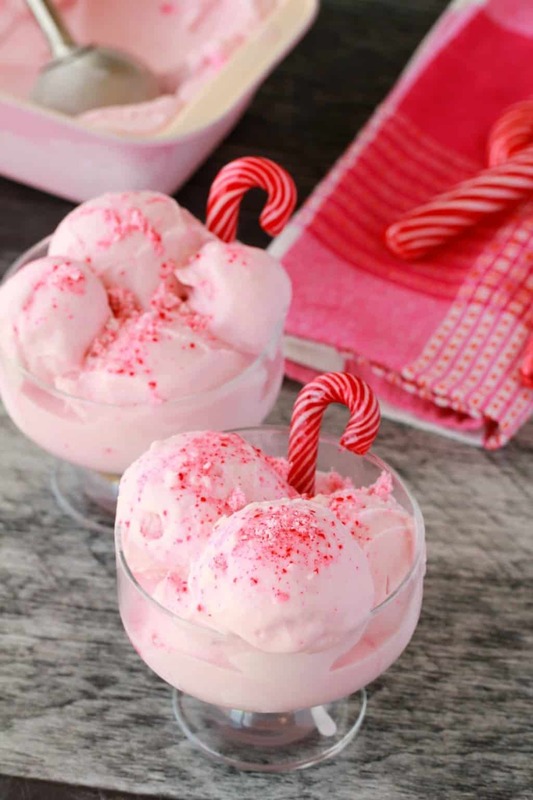 You’d likely just have less of a pink color as the color from the candy canes wouldn’t have as much time to seep through the ice cream. The candy canes I got were also very pink/red (I had two different kinds) so if yours are less so then the color is also going to be less strong. 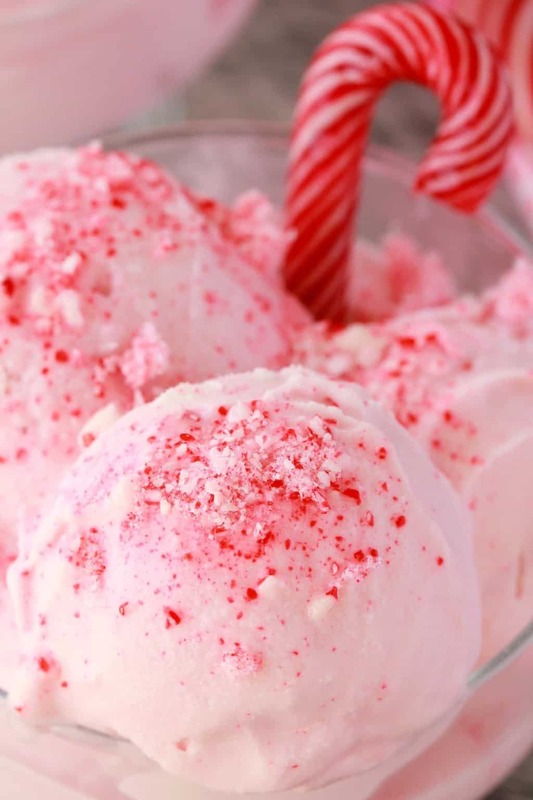 But this ice cream is not about the color, it’s about the glorious peppermint flavor and using some peppermint extract along with peppermint candy canes makes the flavor really pop. 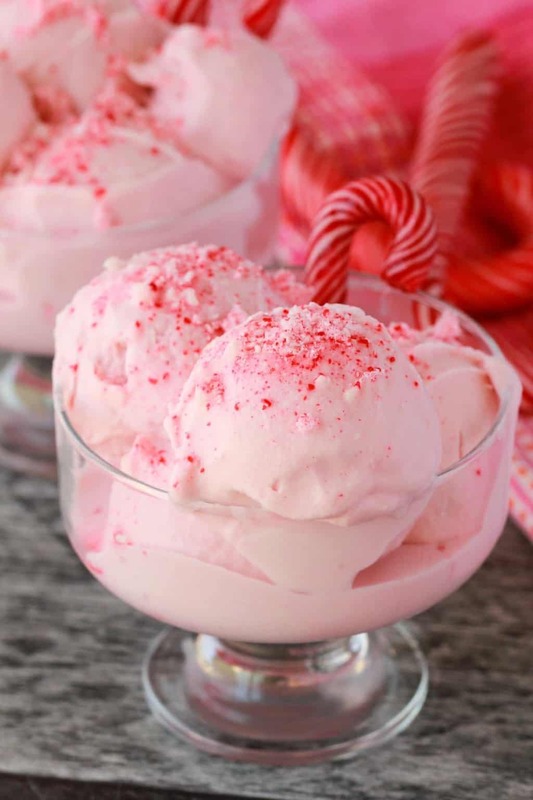 And then you add crushed candy canes to the top of the ice cream when you serve it as well. Perfect! As you can see, when serving it, it got a little melty! 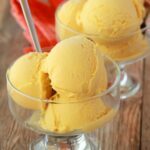 We’re in the midst of summer here in South Africa, which is lovely, but when photographing ice cream…. Christmassy, but good for anytime of year too! The texture of this ice cream is spot on, not a hint of graininess, just smooth, creamy ice cream goodness! 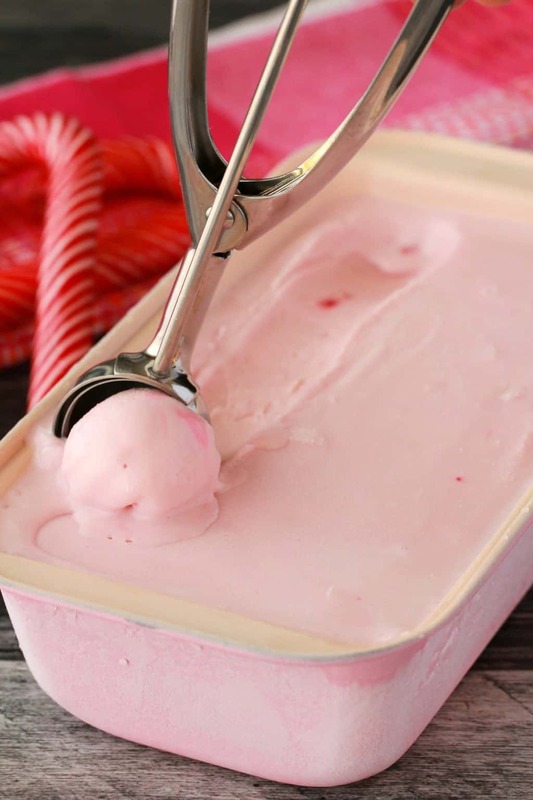 So let us know your thoughts on this lovely vegan peppermint ice cream! Comment down below. 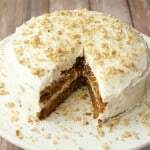 And if you make this recipe, please rate it and let us know how it worked out for you! Pics – please tag them #lovingitvegan on instagram so we can see them! Makes us super happy! And that’s not even all of them, type ‘ice cream’ into the search bar to find all the flavors we’ve done so far! Sign up to our email list while you’re here and get an awesome free recipe book, and stay updated with all our latest recipes! 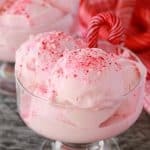 The smoothest creamiest vegan peppermint ice cream topped with crushed candy canes. 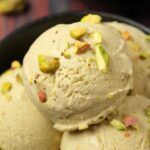 This vegan ice cream is loaded with peppermint flavor and fabulous any time of year! At least the day before you want to make ice cream, put the bowl of your ice cream maker into the freezer to freeze. Add the coconut milk, coconut cream, sugar and syrup to a saucepan and heat, stirring all the while, until it reaches a simmer. Remove from heat and blend with an immersion blender for 30-seconds. 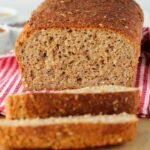 This removes all graininess from the texture. Add in the peppermint extract and stir. If you don’t have an immersion blender, then transfer it to a blender jug and blend, being careful that the lid is on firmly as the mixture will be very hot. Transfer the blended mix into a container, cover the container and place into the fridge to chill overnight. 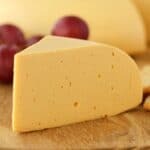 If you need it faster, then you can chill it for a few hours in the freezer. It needs to be completely chilled before using. 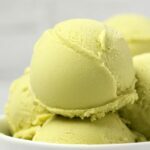 When the mix is chilled and your ice cream bowl is frozen, start the machine up and pour your mixture in and churn according to manufacturers instructions, but usually for between 20-40 minutes or until it reaches a soft serve consistency. 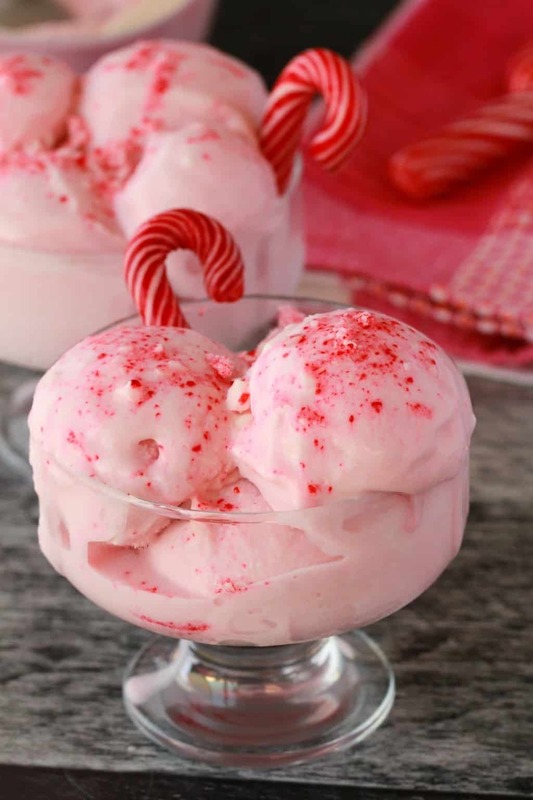 You can either add your crushed candy canes in at the beginning of the churning process (the candy pieces will melt in during the churning and your ice cream will be very pink) or right before you’re done, just a minute or two before you’ll stop the churning. If you do it that way the candy pieces will mostly stay whole and the ice cream won’t change color quite as much. When soft serve consistency is reached, transfer the ice cream into a loaf pan and smooth down with the back of a spoon. Cover with foil and place into the freezer to set properly. 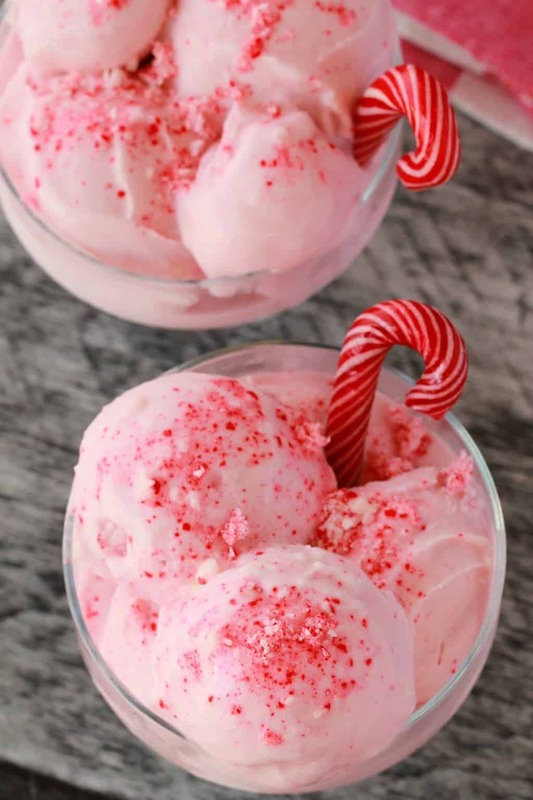 Serve the ice cream with more crushed candy cane pieces. *The amount of crushed candy canes you add in is up to you, a half cup would also be fine. You don’t need to be precise in this measurement at all. You can make it without an ice cream machine, my mom makes my ice creams and doesn’t have an ice cream machine and she says they come out perfect. It takes a bit more work though, whip the cold mixture up with an electric mixer. Then let it freeze until it’s starting to get frozen along the sides then take it out and whip it up with the electric mixer again. and then freeze again, let it thaw slightly and then whip again. You can whip it for quite a bit each time, the purpose is to remove all the ice crystals so that you get the smooth texture you’re going for. You should do this about 4-5 times. 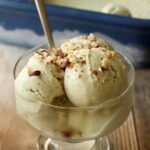 I will definitely do a no churn ice cream recipe soon, I have found that if you use dates as a sweetener, you can get a great texture ice cream without churning or whipping, but I don’t know that dates would work well in this peppermint ice cream so I think whipping with the electric mixer will be the best bet! 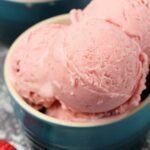 I’m pretty crazy about all things peppermint so this ice cream is right up my street! 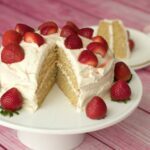 Totally delicious and perfect for the holidays! 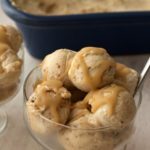 I just made my first batch of this very delicious ice-cream and although I didn’t have the correct size cans of coconut cream I used 2 cans of 5.4 ounces coconut cream and one can of Classic Coconut milk that was 14 oz. 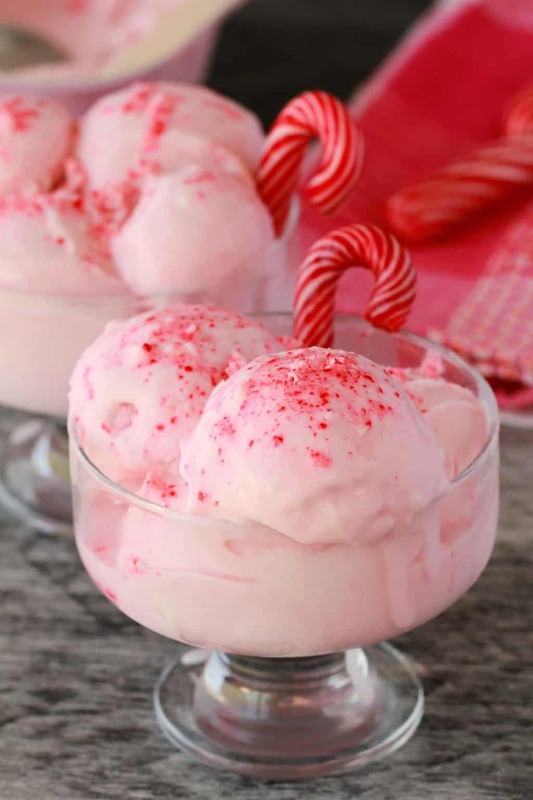 I added the full 1 Cup of crushed peppermint candy canes at the very beginning of the churning of my ice-cream making, I think it turned out fantastically!! AND I will be adding this to my ice-cream recipe folder. I have never heard of nor seen coconut cream before today, as it’s not easily found in the 14oz can sized. But like I stated I’m not sure it made that much of a difference. It’s very pink but I love it and If my wife doesn’t like it well I’ll have something sweet for myself, but I’m hoping she does indeed love it, because I made it for her as she’s lactose intolerant.